Happy Friday everyone! Is it just us, or was that week extra long? We’re so looking forward to a nice relaxing weekend, with zero plans! 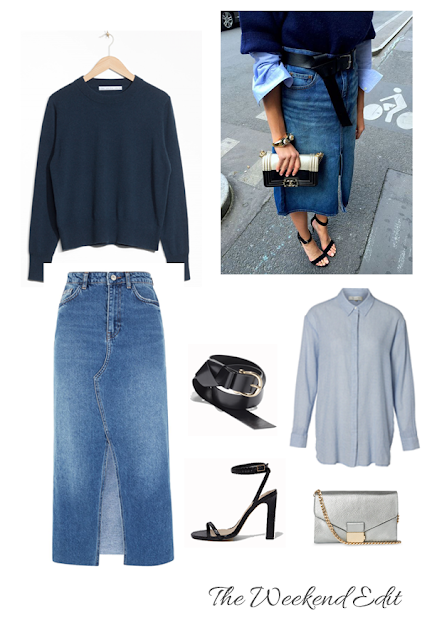 Although it’s not bare leg weather just yet, this denim midi skirt is a Spring wardrobe essential. We love the layered look of the jumper with the blue shirt – simple but so chic! Sleek black accessories complete the look, along with a metallic clutch to add a little sparkle. Some of you will remember this bag from a few weeks ago – a sale bargain from Whistles that we featured with this outfit. Aside from the fact we love it so much, we’ve styled it up again to just how versatile it is! Previous Post Casual spring footwear….